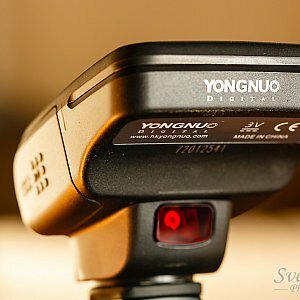 I ordered the Yongnuo YN-E3-RT immediately after its release. Three weeks later the package arrived at my door steps. 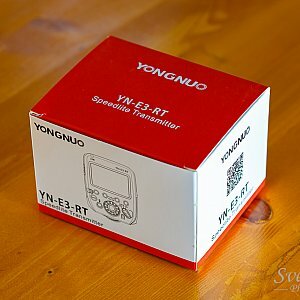 It contains the retail box of the Yongnuo YN-E3-RT. 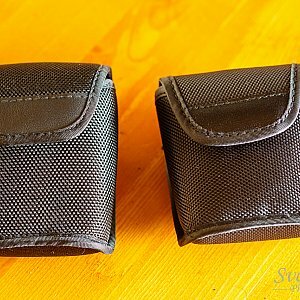 In addition to the flash trigger you have manual, a pouch and two camera trigger cables in the box. 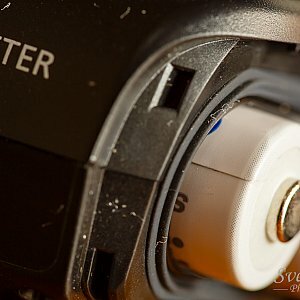 The YN-E3-RT features an USB-port for firmware updates. It needs to! 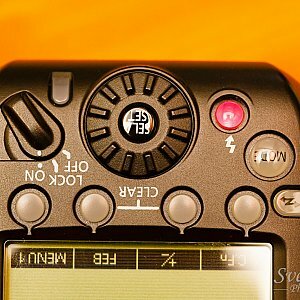 When I connected the device to my 5D MKIII I was not able to trigger a flash in a useful way. But after updating the firmware to 1.0.7 it worked as expected. 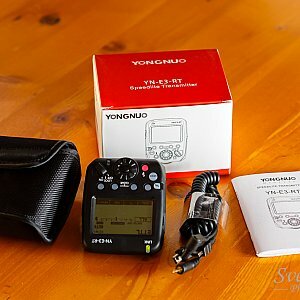 You can get the latest firmware here: http://www.hkyongnuo.com/e-detail.php?ID=337. You can find the technical specification there too. The guys over at FlashHavoc already point out firmware version 1.0.8. 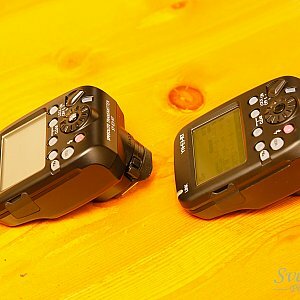 The next months will show how reliable this device is in comparison to the original from Canon. Both of my wishes are build into the YN-E3-RT. 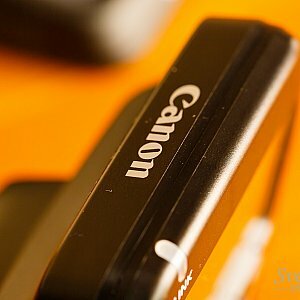 If you're working in a dark environment the Canon ST-E3-RT is basically useless. 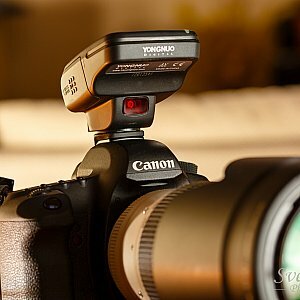 You can trigger the speedlites but this does not help that much if your camera can't focus. The YN-E3-RT offers a build in AF assist light. 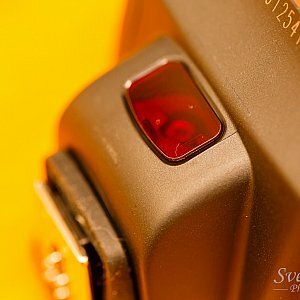 It is the same light you can find in the YN-622 or their eTTL flashes. It is very bright and helps a lot to lock the focus on the target. When you mount a ST-E3-RT on a camera older than 2012 you'll get a awesome sync speed of 1/125. This is unacceptable. But the YN-E3-RT is here to help. You get your max flash sync speed back. 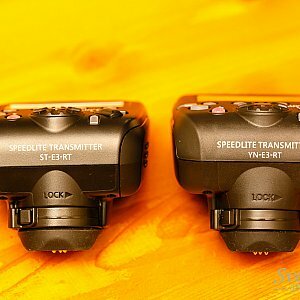 It seems like the transmitter behaves like a normal eTTL flash. 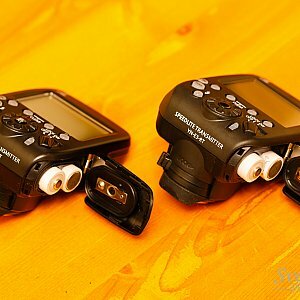 The camera is not able to control the wireless options using the speedlite settings menu. 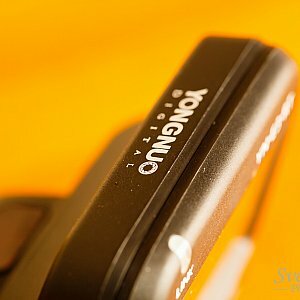 You need to configure everything using the YN-E3-RT controls. But that's fine for me since this also means you get GR support for this type of camera. 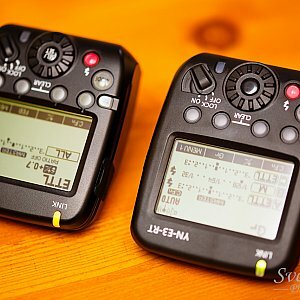 GR allows to use groups with different flash modes at the same time. You can use eTTL for the main subject and Manual mode for the background for example. Besides the differences mentioned above there are other things one can compare. While the YN-E3-RT looks exactly like a copy of the ST-E3-RT at the first glance it's slightly different. It's a bit larger, the build quality feels a little cheaper and the buttons and switches are not that tight as the ones from the Canon unit. 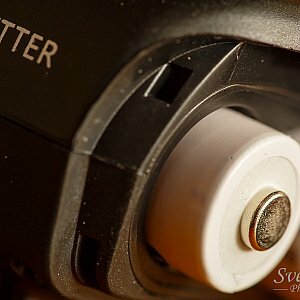 From my perspective the Canon unit offers a better weather sealing due to the fact that is has a rubber gasket instead of just plastic at the battery compartment. 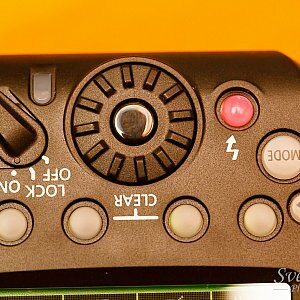 The display offers just the green color while the Canon unit can be switched to use orange color. With the firmware version I used the YN-E3-RT is missing the display related custom settings at all. 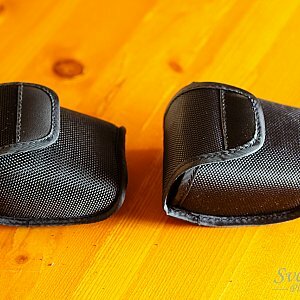 Finally the Canon pouch feels better padded. 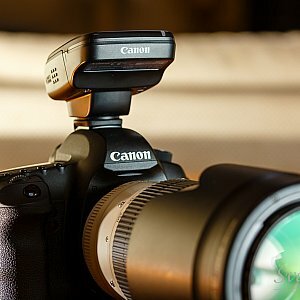 The YN-E3-RT is a welcome addition to the Canon line up. It offers some additional features and a very competitive price without the need to get used to a different of using the devices. Until now I can't find a good reason for not getting this device. The future will show if it lasts as long as the original does.